There was a time when differences could be found in cars; some were better made than others were, some were more reliable, and some were to be avoided completely. In today’s world however, most cars are well built, and reliable. 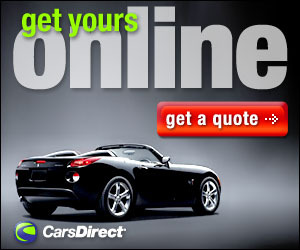 It simply comes down to what a buyer can afford and/or need in a car that decides what will be put in the driveway. That being said, today’s cars can only really be separated by their design, function and accessories. In the end, for a buyer it comes down to personal preferences, suitability and of course, what a person can afford. Usually when we get a new car for the week we spend time trying to find all the good things about it. Since we generally like all things automotive we can usually find things to like. Some weeks it might take longer than others, but in the end we can usually find at least a few positive things to say about a vehicle. We can then report not only the basics of what a vehicle is, but what it was we liked about it and any obvious things that we didn’t. With the Cadillac, our mindset is a bit different. With the Cadillac, that once ostentatious brand that took up an entire lane and sucked gas like a thirsty camel at a desert oasis, we tend think backwards. Instead of trying to find the positive things, we work in reverse. We try to find the bad things hidden among all that goodness. Because today GM through its Cadillac brand has produced a thing that is very good, very well built, and has very few flaws. So it was that when delivered the 2016 Cadillac Escalade for a week that we set about trying to find the bad things. We shall spare you the trouble of reading to the end. During our week, the good far outweighed the bad. 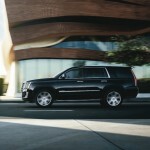 Speaking of the once ostentatious Caddy, the Escalade is sort of a throwback to that era. It’s big, brash, in your face and not long removed from being the vehicle of choice for rich rap artists and professional athletes sporting plenty of bling and cash. We don’t rap, and the only athletic activities we engage in involve walking to the refrigerator for another beer. But that doesn’t mean we can’t enjoy the trappings of such people. 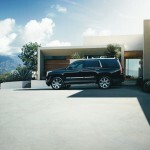 The Escalade never announces its arrival quietly. Like the rap stars and athletes, there is plenty of bling. However, the big SUV got a makeover in 2015 giving it a more refined look. Yet the Escalade retains its rolling elegance especially given the front end that still sports its sweeping flashy front end lined with LED lights, and the shiny chrome wheels. There is no doubt that something large, and special is coming. For 2016 there were only a few minor additions, an enhanced CUE infotainment interface, a front-view camera and available lane-departure intervention as well as some new colors, and that is a very good thing, because the Escalade was a very good thing that needed little more. 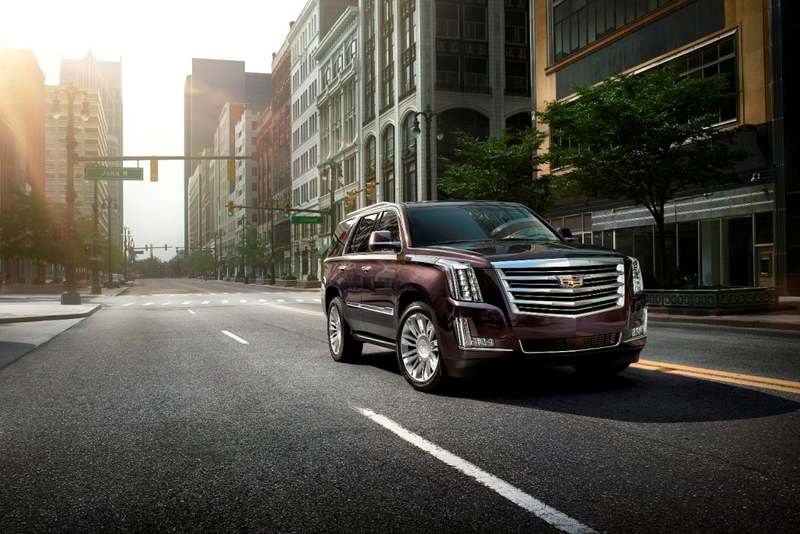 The 2016 Cadillac Escalade has four trim levels. You can carry seven passengers with the standard second-row captain’s chairs and eight if you add the second-row bench seat. 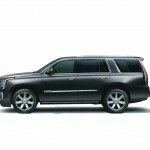 There is also an Escalade ESV extended-wheelbase model that increases third-row legroom and cargo capacity. Cadillac’s are known for being loaded with standard features, to try and list them all would require a novel. Some of the highlights however include GM’s Magnetic Ride Control, automatic LED headlights, automatic wipers, front and rear parking sensors, running boards, a hands-free power liftgate, power-folding and driver-side auto-dimming mirrors, along with keyless ignition and entry. The interior features include leather upholstery, heated telescoping steering wheel, heated and ventilated eight-way power front seats with four-way lumbar adjustment and driver memory functions, heated rear seats and split power-folding third-row seats and power adjustable pedals. The standard electronics include the CUE system accessible via an 8-inch touchscreen, a customizable instrument panel, a navigation system, real-time traffic, surround-view camera system, and a an active noise cancelling Bose 16-speaker audio system. The Luxury trim adds automatic high beams, power-folding second-row seats, a heads-up display, blind-spot monitoring system, lane-departure warning and intervention, rear cross-traffic alert, forward collision alert and a safety alert driver seat that buzzes a warning when needed and a sunroof. All set atop 22-inch wheels, (as opposed to the 20-inch on the base model). Moving up to the Premium trim adds a rear entertainment system with a Blu-ray player and a ceiling-mounted flip-down 9-inch screen. There are also cornering lights, adaptive cruise control, and forward and reverse collision mitigation with automatic braking. Our tester for the week was the top of the line Platinum. 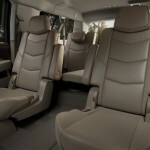 Our model had 14-way power front seats with four-way lumbar adjustment that were heated and ventilated. There was also upgraded leather simulated suede accents and headliner, an electrically cooled box in the center console along with two more rear entertainment screens mounted behind the front seats that can be used to view more than one video at a time. We also had the Power-retracting side steps with approach lighting that are a $1750 option on the Premium and Platinum trim levels. Our favorite feature however was the massager in both front seats. In fact, we loved the seat massager so much we named it “Edwin”, as in “Edwin we are a little tense from all this traffic, please give us some relief”. 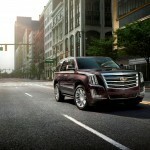 Under the massive Escalade hood, a 6.2-liter V8 engine produces 420 horsepower and 460 pound-feet of torque. The powerplant is mated to an eight-speed automatic transmission and power is delivered either to rear wheels or to an available four-wheel-drive system. Our tester had selectable two wheel/four wheel drive. On the road the Magnetic Ride Control adapted the suspension to provide a smooth ride over any surface. The power was more than adequate (0-60 in an impressive 5.5 seconds in 4WD) and we were surprised, pleasantly, at the fuel mileage. The EPA estimates 15 city, 21 highway and 17 combined. We got more like 22 mpg during our week driving on both city streets and the highway. The visibility was excellent and the drive superb. Edwin helped keep us calm in traffic and park assist came in handy allowing us to park alongside those little cars that many other large SUVs would avoid; no parking in the empty spaces far from the front door for us. 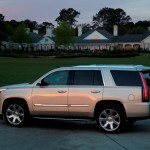 As mentioned, during our week we tried to find things that were wrong with the Escalade. We really did. However, every time we tried Edwin would be turned on and remind us that to drive such a thing as this means that you arrived; you deserve this type of luxury. Yes, the lid on the cool box can be somewhat annoying, the Power-retracting side steps aren’t for everyone and despite the power you won’t be zipping around like a sports car. But as we expected the Escalade is a thing of beauty, with a stellar exterior design, a beautifully appointed and luxurious interior, and a drive that makes the journey as much fun as the destination. With gas prices low and prosperity spreading let us then rejoice in such a thing as the Escalade. No, not all of us can afford one, but for those who can, they should. The Escalade is almost a piece of Americana, something to show the rest of the world what success in the good old US of A can get you. You don’t need to be a rap star or professional athlete to drive an Escalade, but after our week with it we wished we were so we could. Goodbye Edwin, happy motoring. Front hip room: 60.9 in. Front shoulder room: 64.9 in. Rear hip room: 60.2 in. Rear shoulder room: 64.4 in. Maximum towing capacity (when adequately equipped) 8100 lbs. Maximum payload (when adequately equipped): 1460 lbs. Cargo capacity, all seats in place: 15.2 cu.ft. Maximum cargo capacity: 94.2 cu.ft. Roadside: 6 yr./ 70000 mi.